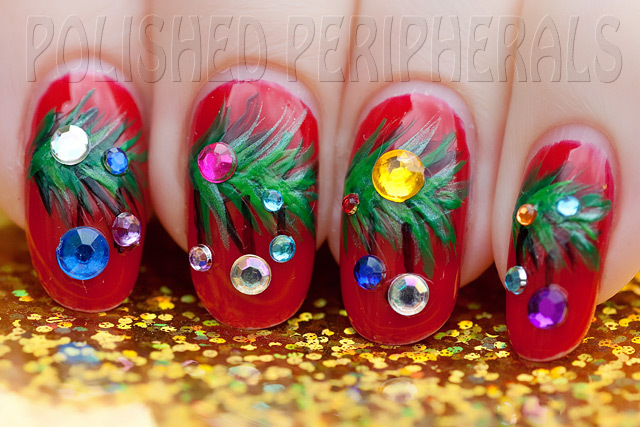 Today's Aussie Christmas Nail Challenge is GOLD. Bet you thought I'd wear Pretty Serious Cosmetics Golden Ticket for this, or some other gold polish. It seems I have quite a few but I wanted to do something different. So I used some nail foil that I got in a sample pack from Ebay. First I painted my nails with one coat of Ulta3 Black Satin, my favourite (and cheapest) single coat black. Then I applied a layer of special foil glue, waited for it to dry, then pressed on the foil and rubbed gently to transfer the design. The foil I used is a black and gold marble design. I used black underwear in case parts of the foil didn't transfer or cracked. This foil actually worked quite well. I got a little bit of wrinkling when I applied topcoat but it's not noticeable to the naked eye, it just looks really reflective, and actually is the smoothest results I've had so far. It's going to be interesting to see how well this wears over the weekend. I have a lot of cooking and cleaning to do in preparation for Christmas. I'm pretty sure it will survive but I have to take it off to do Sunday's nail challenge. If you want more info on nail foils check out Natalie's blog http://www.walkinmyeyeshadow.com/, in particular her introduction to nail foils. OK I have a confession. I don't really like candy canes much and I'm not really sure what they have to do with Christmas. That said the house is full of the things. It seems it's the 'thing' for the school kids to give each other Christmas cards with candy canes attached so we have a pile of canes my 7yo brought home from school and a pile of left overs from the ones we had to buy to attach to his cards. He needed 25 and they came in packs of 12 = lots left over. He doesn't like them either. The 4yo does but he's not allowed them often. 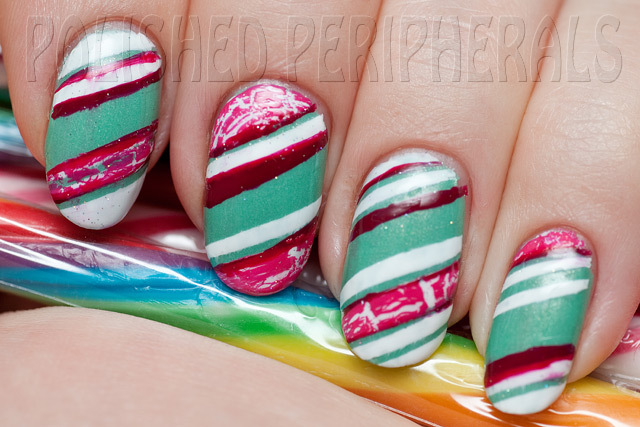 All which means I had plenty of candy canes to study for the Candy Cane Aussie Christmas Nail Challenge. So I have no idea why I started with a mint green base and used crackle. It's really quite a mess. I should have taped that red rather than free hand and then the topcoat smudged it all. I think it looks more like wrapping paper. I used Sinful Colors Mint Apple (love it) for the green, Ulta3 Lily White for the white, Sally Hansen Fuchsia Shock for the crackle and OPI Colorful Years for the red. I did double duty again yesterday with Aussie Nails Monday and the Aussie Christmas Nail Challenge. 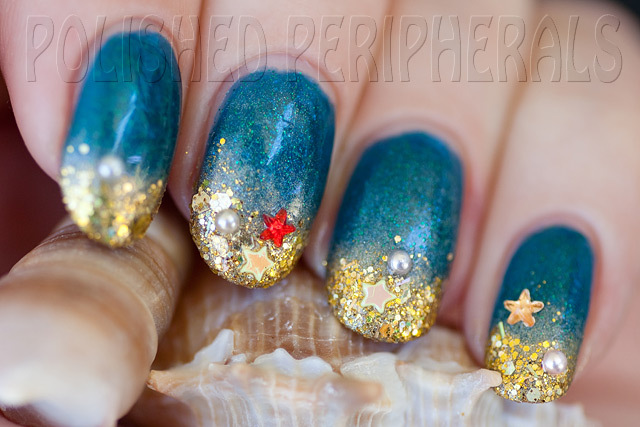 The Aussie Christmas Nail Challenge theme was Beach and the Aussie Nails Monday challenge was Sponging. I started with the brand new Party by the Pool by Pretty Serious Cosmetics from the Christmas Without Snow collection. I love Pretty Serious polishes and just had to grab the whole collection. It's a Christmas collection with a difference, it's designed for our hot Aussie Christmas. It arrived last week so I've been dying to wear it but with all the challenges I haven't found a way to fit any of the new collection in, until now. 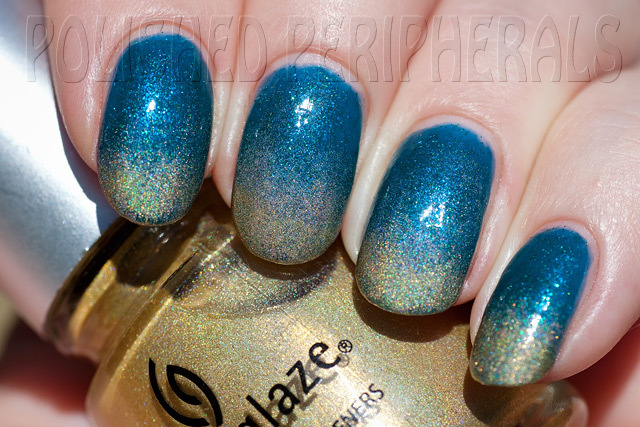 Party by the Pool is a gorgeous teal jelly with specks of blue and green shimmering in it's depths. I thought it would make the perfect sea for my beach nails. This is three thick coats with topcoat. There was still visible nail line but I wasn't concerned about that, not with my sponging plans to cover it. I could have used some matching underwear polish to hide the nail line but that would have spoiled the beautiful jelly effect. That was my water, then I started sponging some wet sand with China Glaze FYI and China Glaze GR8. I actually put blobs of Party by the Pool, FYI and GR8, in that order, on a piece of makeup sponge then dabbed all together in a single layer over my Party by the Pool base. I really like the result. It looked like the wet sand colour I wanted and in the sun the holo added the shimmer of sand at the waters edge. That wasn't enough though for my beach nails. I needed more 'sand', some coarse golden sand and I had the perfect polish! Like the rest of the collection I can't wait to wear this one on it's own but for now it was my sand. I sponged a layer of Golden Ticket across my tips. Sponging gave me a much rougher, sandier, finish than brushing it on would. Normally this would sit pretty smooth with a topcoat but I wanted grit. 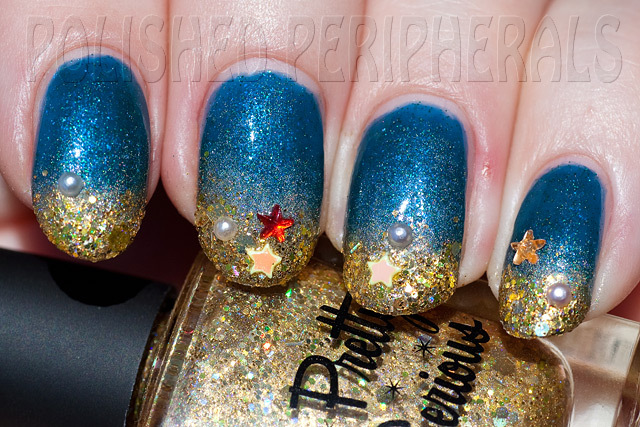 So I left it without topcoat and added some little starfish and pearls. I actually had more starfish and pearls before I made lunch. Not sure where they went and I think I ate some gold glitter. I ate a rainbow cupcake with white frosting and edible gold glitter (I made 2 dozen for the school party) and licked the glitter and frosting off my fingers. 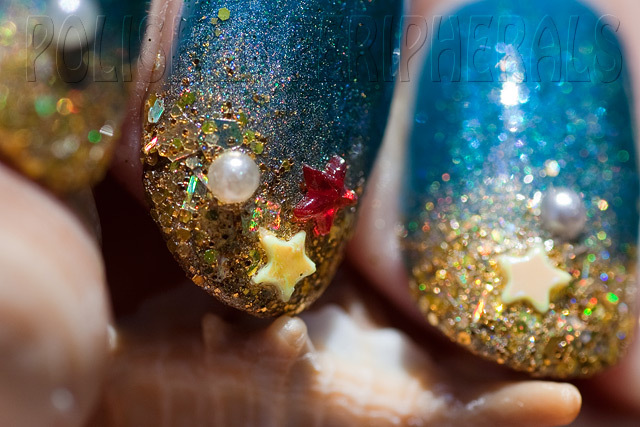 Not sure where the edible glitter ended and my nails started :( If you're wondering what I'm holding, they're shells. 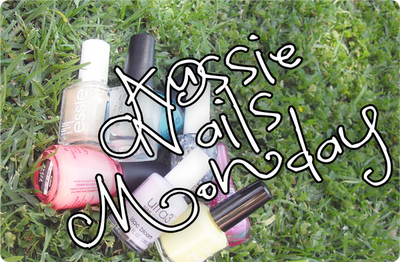 Here's the rest of the girls doing the Aussie Nails Monday Challenge. 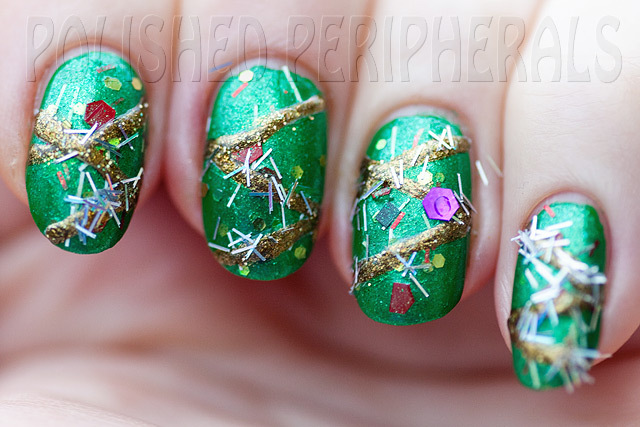 Today's Aussie Christmas Nail Challenge is CHRISTMAS TREE. I knew exactly which polish I wanted to use for this as soon as I saw it. Loki's Lacquer Max Help Me.... I'm Feeling! 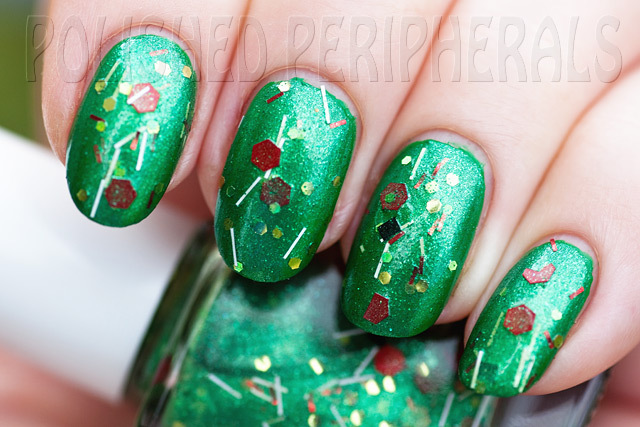 The name is a quote from the movie The Grinch and yeh the colours are all Grinchy but to me the polish looks just like a Christmas tree. Looking at the bottle it's just like looking into the tangled innards of a decorated pine tree. Then I added 2 coats of Max Help Me.... I'm Feeling! This is without top coat. Then I ruined it. I painted on strings of tinsel in a-England Holy Grail (the new edition). It wasn't too bad at that stage but I had the brilliant idea to stick silver holo bar glitter to the tinsel strings. I'm going to have to revisit the Frog Prince and Max Help Me.... I'm Feeling! without the tinsel 'art' one day. 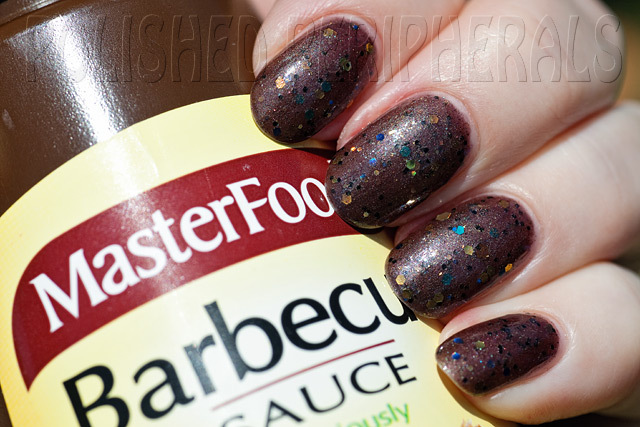 Our next Aussie Christmas Nail Challenge theme is BBQ. A good Aussie tradition, especially in summer, but in our family we don't have a lot of BBQs. Rather we have cremations (in more ways than one, we live next to the cemetery). My darling husband (he who buys me polish) is Master of Burnt Offerings. So I considered gluing lumps of charcoal to my nails, or just painting them black and serving with sauce, but BBQ seemed like the perfect excuse to wear this polish I made myself. I call it Pest Control. It's perfect for exterminating those pesky sausages and looks a lot like the charred remains that grace our dinner table after a BBQ. We'll we don't have a Black Friday here but I start early, around the middle of the year when the half yearly toy sales are on. That's what comes from having kids. I look out for bargains and also try to anticipate what the kids interests will be by Christmas. Can I choose a TV show instead of a movie? I'd love to be in any of the Doctor Who Christmas specials. Christmas Day. Christmas Eve usually involves a lot a mad panic wrapping, cooking and cleaning. I much prefer surprises, even if I have to buy them and hide them for myself. I've bought a couple of things this year I needed (like some stuff for my hair and nail polish) and hubby can give them to the kids to wrap up and surprise me. Santa's Workshop. I love men who are handy with their tools and can you imagine the crumbs in a gingerbread house? 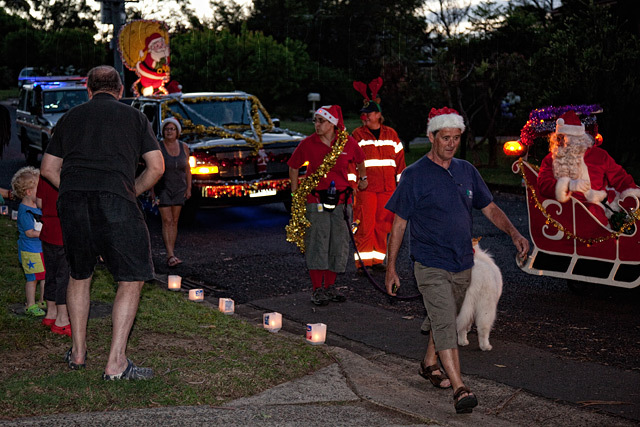 Christmas Eve we take the kids to my parents where Santa has a parade around the local streets. 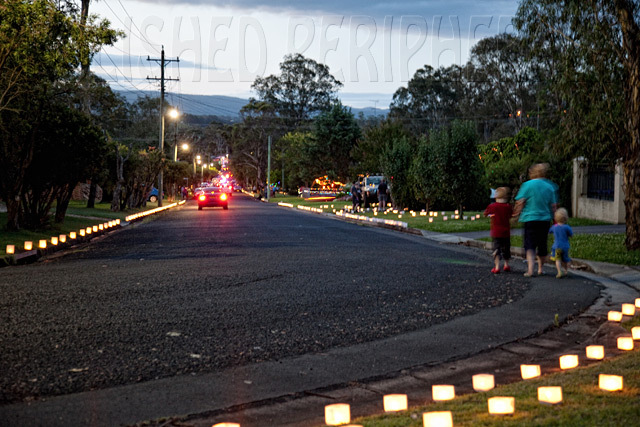 All the neighbours put on a light display and line the curb with candles in cut off milk bottles. 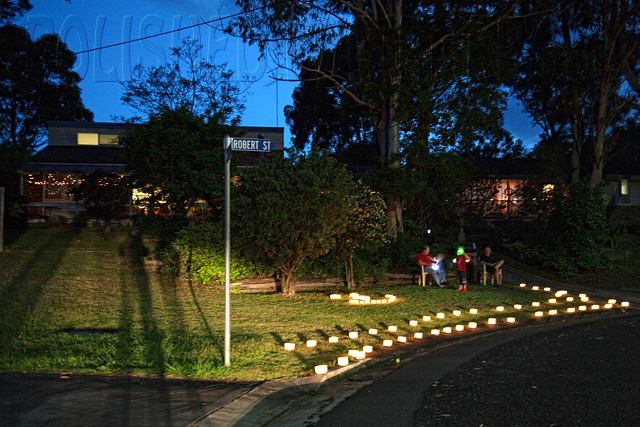 We sit out the front tending the candles and waiting for Santa and then we walk up and down admiring the lights and catch up with neighbours we haven't seen since last year Christmas. Some people set up tables outside and have their dinner on the front lawn. Here's some photos from last year. The kids and Grumpy talking to Santa and his helpers. The kids and Nana off for a walk down the road. 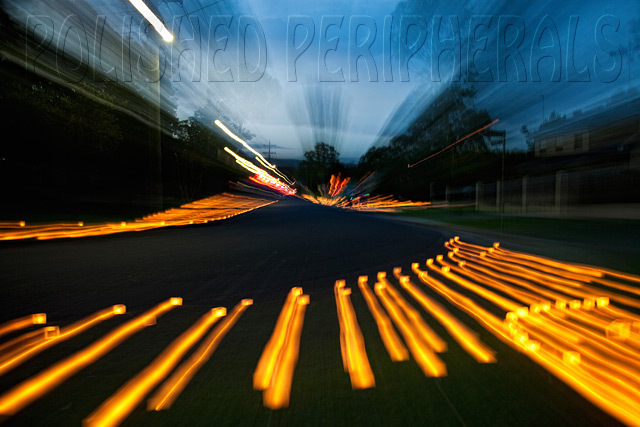 Getting arty with the zoom lens. Looking back at the boys watching the candles. My husband of course. I'd be in trouble if I said anyone else right? A red star from Ikea but I'd love a weeping angel. If anyone knows where I can get a Doctor Who weeping angel please hook me up. As in the song? Yep. Though I've noticed these days most people seem to think the 12 days are a count down to Christmas but I was taught it's a count down after Christmas. In religious terms it's 12 days after Christmas to the Epiphany on January 6th. As a child for me it was always 12 days after Christmas that Dad was on holidays and the decorations had to come down on the 6th and Dad went back to work on the 7th. Which was sad because it's my birthday on the 7th :( I still believe it's unlucky to leave the decorations up past 12 days and many Australian businesses still shut down over Christmas until the 7th. nope. Does anyone do that in Australia? Yes and not enough! We have an advent calender which the kids open each day. and I have a list of mail I'm expecting and I'm running out of delivery days before Christmas :( I ordered stuff from overseas last month that hasn't arrived yet. Mom's mince pies and Christmas cake. She makes it months in advance then pours alcohol over it regularly in the weeks before Christmas and I get to decorate it. My Mom is the best cook! This year I'm doing roast pork and turkey, trifle and tiramisu for lunch. Leftovers, ham, vegetarian lasagna and nibblies for dinner. Maybe a pineapple cheesecake as well. For me Christmas is all about family and our little family is growing. Having kids makes it extra special, it's all about making it amazing for them now and I looooooove giving people pressies. I get so excited about planning the prefect surprise for people. All that's missing in my brother and his family, in Sweden. I have a few challenge catch ups to post. I've been doing my nails for the Aussie Christmas Challenge and Aussie Nails Monday but am behind on blogging them (I've been a bit pre-occuppied with Christmas planning and partying) so here's the last few. Sunday was the Aussie Christmas Challenge theme GREEN. It was also the day of hubbies work Christmas party for families so I didn't get to do my nails until Sunday night. For the party I just wiped off all my polish in the morning, leaving the red Gelicious. 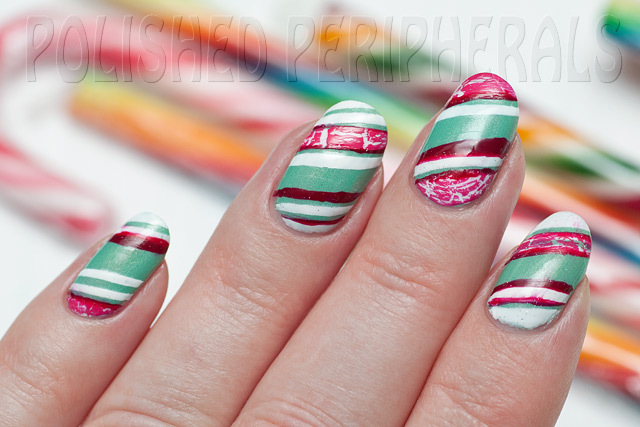 A quick and simple Christmas manicure. 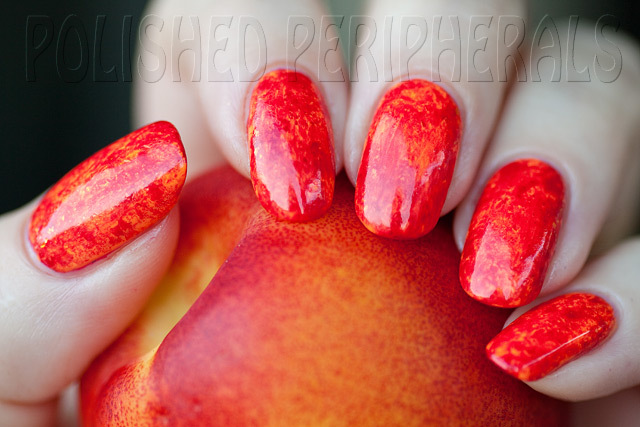 I didn't realise until I saw the photos from the day just how long and red my nails looked. They really stood out! Oh and on Saturday I dyed my hair brown. It was a big step for me, going darker and doing it myself, but it was actually quite easy. The colour is darker than I expected which could be because it's over blonde but at least it didn't go orange. I'm not sure how long it will last, I expect it to fade quite a bit and it could look strange when my roots grow in lighter. I'll have to rethink the colour then. 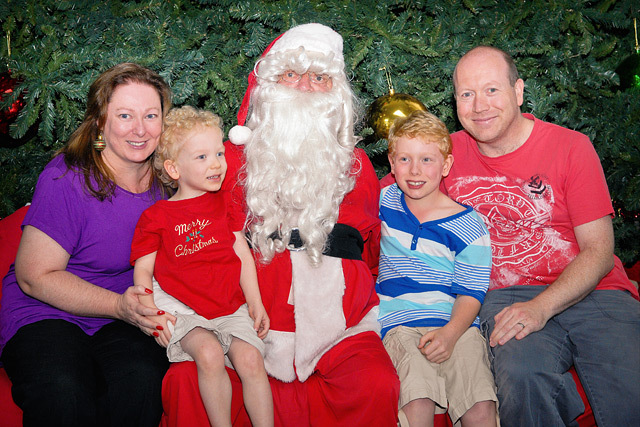 Here's a family photo with Santa from the party, see the red talons and brown hair. It doesn't look too dark in the photo. The flash has lightened it but I don't look like the rest of the blonde/ginger family anymore :( My hair is closer to my mother-in-laws colour now. Please excuse the lack of makeup. It was just a hot afternoon carols and a sausage sizzle for lunch so we didn't bother dressing up, then we impulsively decided to all have a photo taken with Santa. 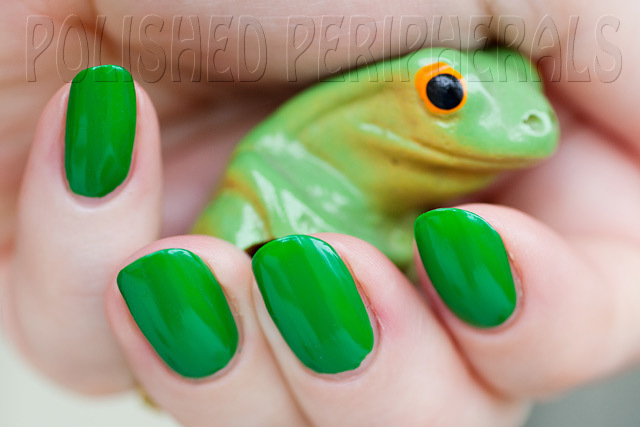 Anyway for my green themed nails I was a bit stuck trying to work over the red Gelicious. I didn't want to just paint over it again, I wanted to either work with it or remove it but I hate having to remove Gelicious while it's still got so much wear left. I've been painting over and removing polish from the Gelicious so much and it takes it all without any lifting but that red base has been my own little personal challenge for over a week now. I thought red was good for Christmas but it's not so good for nail art underwear. 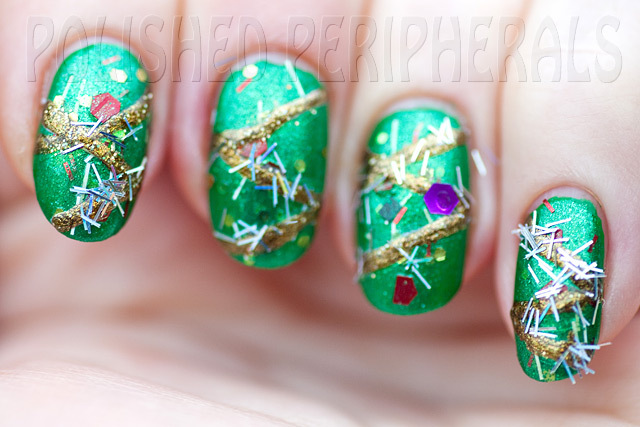 I have a lot of green polishes and green is my favourite colour but for me Christmas green is all about the tree. We have a Christmas tree theme coming up later in the challenge so I didn't want to paint trees. In the end I just painted some green pine branches across the red background. I used a bunch of Ulta3 greens for this, mainly because the Ulta3 drawer is the one closest to my desk :) This was actually a really quick and easy design to do and I liked the feathery foliage. This led nicely into the next manicure challenge which was Aussie Nails Monday with the theme of DELICATE. I had a lot of ideas for delicate but wanted to make it Christmasy. We've been decorating the tree and I think pine needles look soft and delicate, (and hurt like crazy when they stick up your nails) and I keep having to remind the boys how delicate the baubles are. Some of them I've had for many years and they're made of iridescent glass. 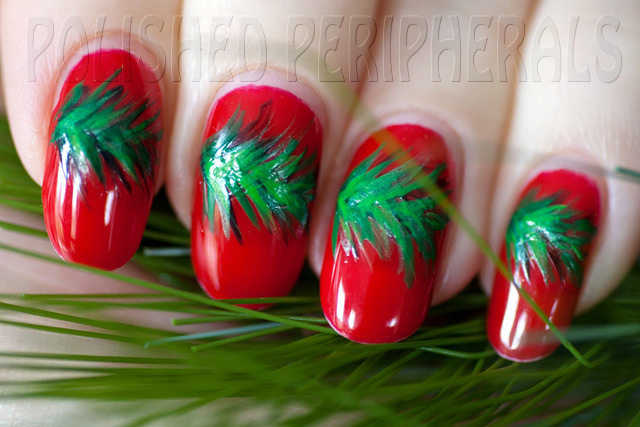 So for delicate nail art I added some Christmas balls to my pine branches. Now todays Aussie Christmas Challenge theme is ELF and I knew exactly which polish I wanted to use but it was time to lose the red. My nails really needed cutting and it was getting a bit hard to come up with ways to do nail art for these challenges over red so last night I removed the Gelicious, cut my nails and this morning I redid them with Gelicious Alive, a very slightly pink tinted clear. This will be my new 'underwear' polish for the next few weeks. 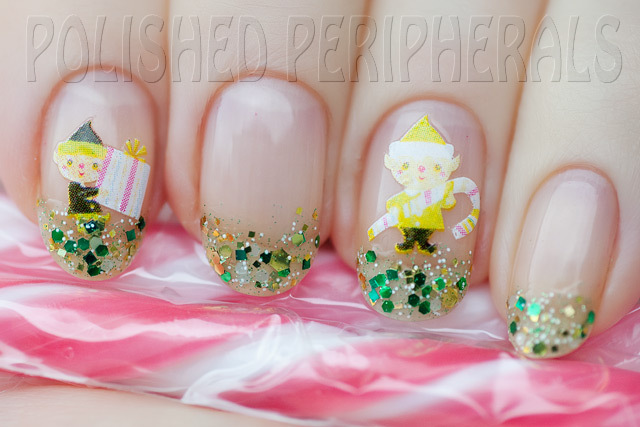 For elves I used some nail stickers I've been hoarding since last Christmas. Strangely though the colour has faded a lot. They've been kept in my drawer away from the light but I'm sure I remember them being a lot more colourful when I got them. I don't use nail stickers much. I prefer water decals because I find stickers too thick usually but these are actually nice and thin. Shame about the colour. 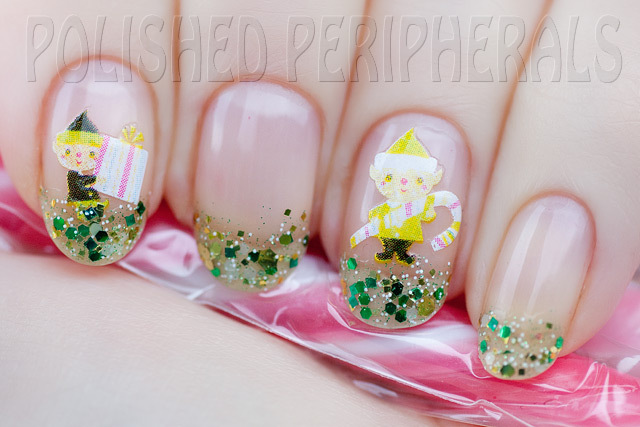 Then for my special elf polish I used Loki's Lacquer Cotton-Headed Ninny Muggins. The name is a quote from the movie Elf, which if you haven't seen you should (go on it's Christmas, watch some silly Christmas movies). 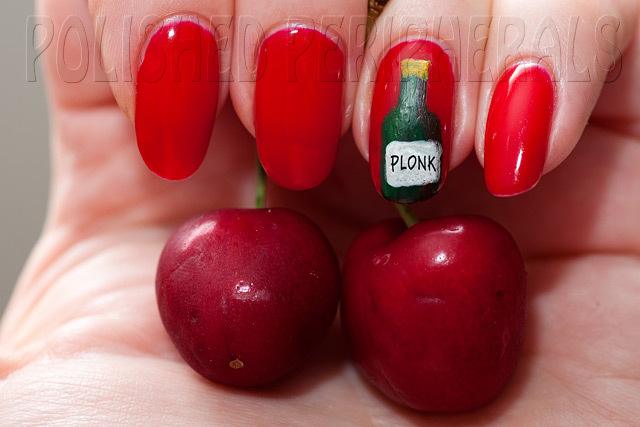 I love the name and I love the polish. I don't know if Tara will be selling this one but she should. 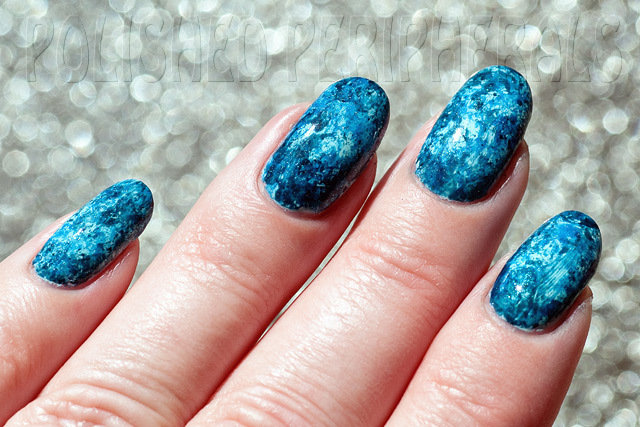 It looks great layered over dark colours to bring out the blinginess of the glitters but for this I just wanted it on it's own across my tips. I think I still had delicate in mind and wanted the tiny glitters to stand out against my nail colour. 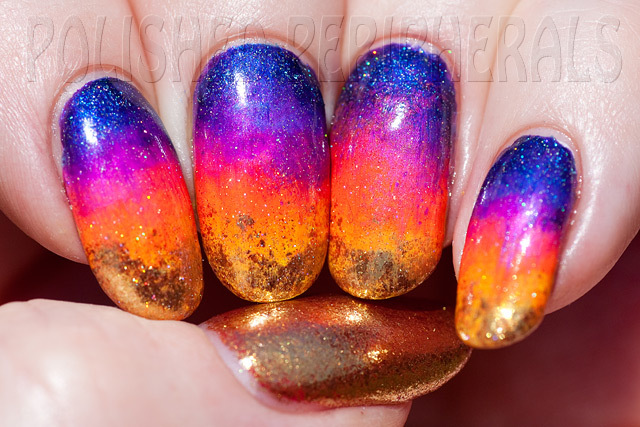 The theme for yesterday's Aussie Christmas Nail challenge was Summer Sunset. I went with the obvious gradient manicure. 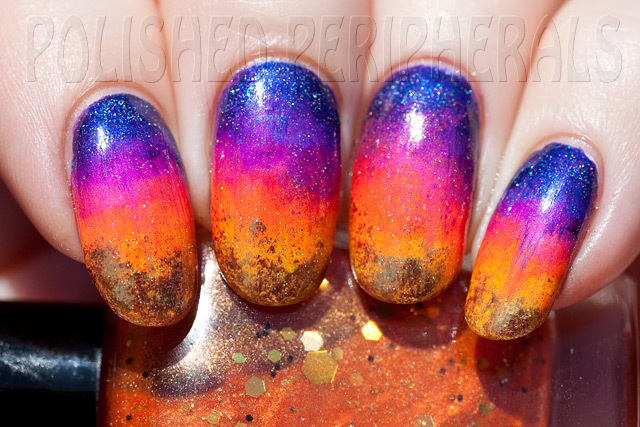 I tried to come up with something different but really a gradient is just perfect for sunset nails. I used a lot of different polishes for this. 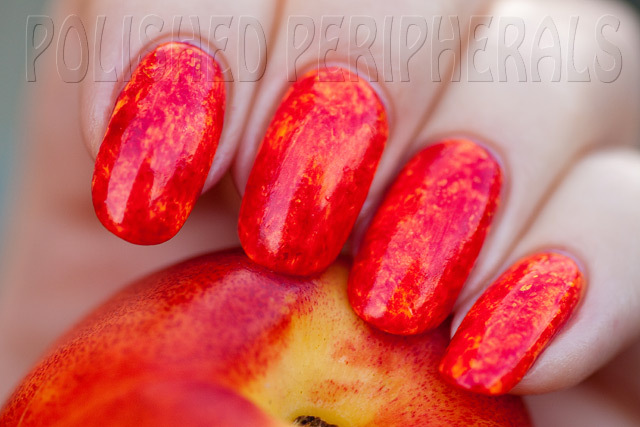 First I used OPI My Boyfriend Scales Walls to cover up my red Gelicious polish with a whitish base coat. It would have been easier to work with the red as part of the sunset but I wanted to use the China Glaze Summer Neons for an eye searing sunset and neons pop more over white. 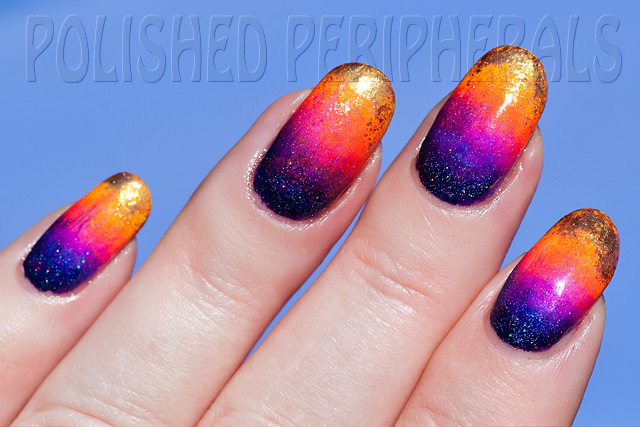 So I first did a gradient using the yellow, orange, red, magenta and blue China Glazes with OPI Tomorrow Never Dies for the indigo purple sky above the sunset. I wasn't happy with the result though so I sponged over with piCture pOlish Crazy, Ulta3 Honolulu, piCture pOlish Fake Tan, Ulta3 Carrot Top, Sinful Colors Dream On and piCture pOlish Cosmos for the starry night sky. Then I finished with some OPI Goldeneye on the tips and 3 coats on my thumb, and a layer of INM Out The Door Northern Lights Hologram Topcoat Gold for extra stars. Phew that's a long name! 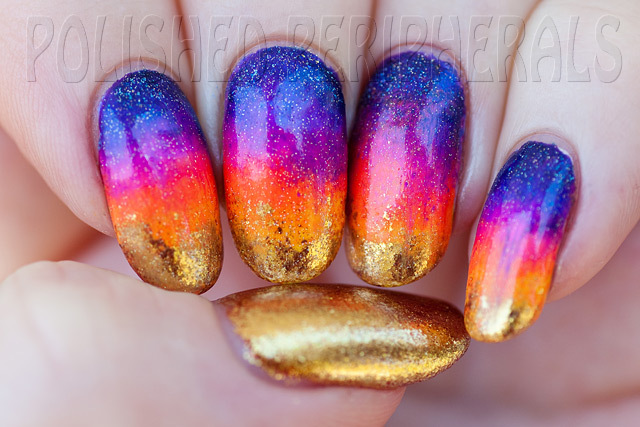 My thumb is supposed to represent the sun setting on the horizon and my nails are the sunset coloured sky. It's a bit messy and was a bit ambitious using so many colours but I like the result. Too bad it has to come off for tomorrows Green theme. I must admit I don't have a lot of experience with pool parties. We don't have a pool and I grew up without a pool. None of the family or our immediate circle of friends has a pool and the kids are still learning to swim (without a pool it's a bit hard). I do know pool parties involve a pool though so I started by painting the water. I'm still wearing red Gelicious polish so first I had to cover it up for my Pool Party nails which meant extra drying time before I could get to the 'art stage. It worked though, you'd never know my nails are bright red under all this. I used 3 coats of Lime Crime Once in a Blue Mousse for my cover up base colour then I used the glad wrap technique from the other day to layer on Layla Softouch Effect 10 and Cult Nails Living Water. I think the layers of blue look something like rippling pool water (it helps if you squint). Then I ruined it. I stamped over the giraffe pattern from one of the Bundle Monsters plates. 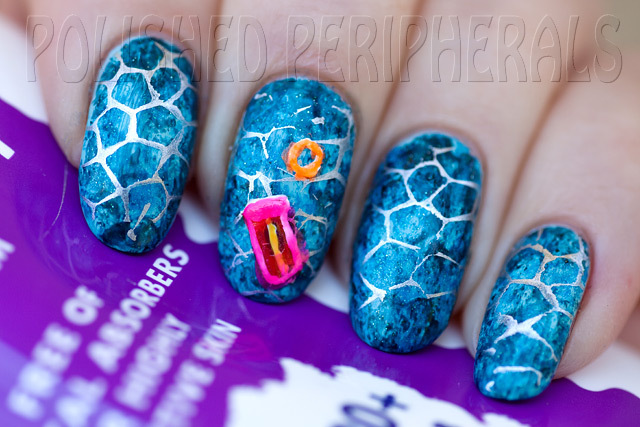 The design was too short for my nails so rather than having a precise cut off line I stamped randomly and roughly, for patchy water ripples. 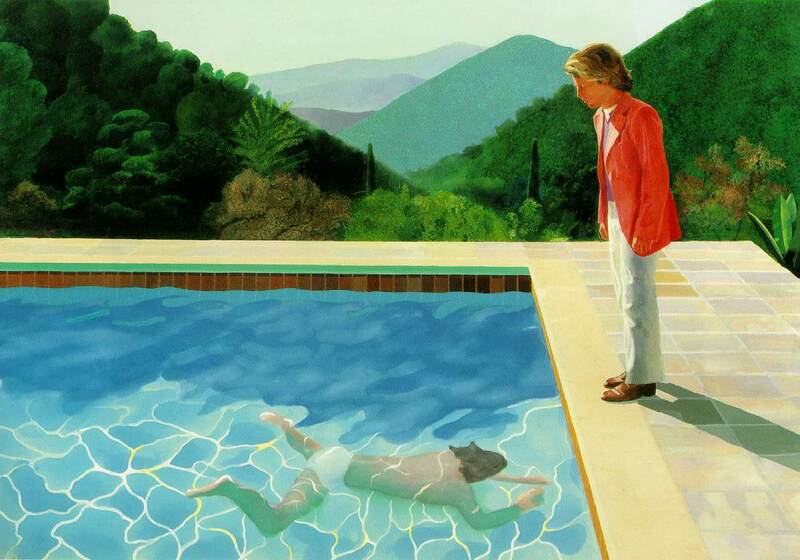 I was aiming for something like a David Hockney painting, I love his pool paintings. I used Barry M Silver Foil Effects for the stamping. I quite liked how it turned out but then I tried to paint on a pool lilo and swim ring and it turned out horrid :( I really need to get a better brush for fine work (and glasses). I left it too late to join the Linkz for this theme but here's the other girls who joined the party. 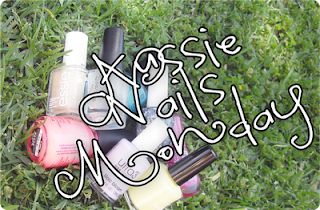 Let's start with Aussie Nails Monday. Today's challenge is Glad Wrap nails. Some parts of the world may call it Saran Wrap or Cling Wrap but here our plastic wrap is most often called Glad Wrap. I still have my red Gelicious polish on so my plan was to just work with that as my base colour but after some tests on a nail wheel I realised, for the look I wanted, I needed a lighter base. So I covered the red with 3 coats of piCture pOlish Fake Tan. Fake Tan is a brilliant orange neon but tends to be streaky so I needed that 3rd coat to cover the red. Then I used balls of Glad Wrap to dab on a layer of Cult Nails Annalicious and then a layer of Layla Ceramic Effect 53. I finished of with a shiny layer of Out the Door topcoat. I love the way these colours worked together. The shimmer in the Cult Nails and the colour shifting flakes in the Layla give this a bit of a metallic/foily look in real life that I just couldn't capture in the photos. It looks hot! I really enjoyed this technique, it's easy and not as messy as I expected. 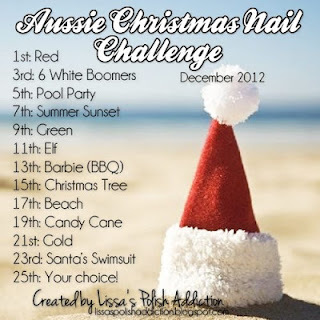 Next we have the Aussie Christmas Nail Challenge for the 3rd and today's challenge is '6 White Boomers'. This one will take some explaining for the non Aussies. Six White Boomers is a song by Rolf Harris. I remember having to sing this in the school choir back in the 70s. In primary school we performed it as part of our carols by candle light night each year. It's not a carol but it was a suitable Aussie Christmas song for us kids and a nice break between Silent Night and other 'real' carols. Everyone in the audience knew the words in those days but I doubt many would now. Here's a youtube link to the song if you want to check it out - http://youtu.be/2FdVXca9hys A boomer is a big Kangaroo so in the song Santa's sleigh is pulled by six white kangaroos instead of reindeer because the heat of the blazing Aussie sun is too much for reindeer. 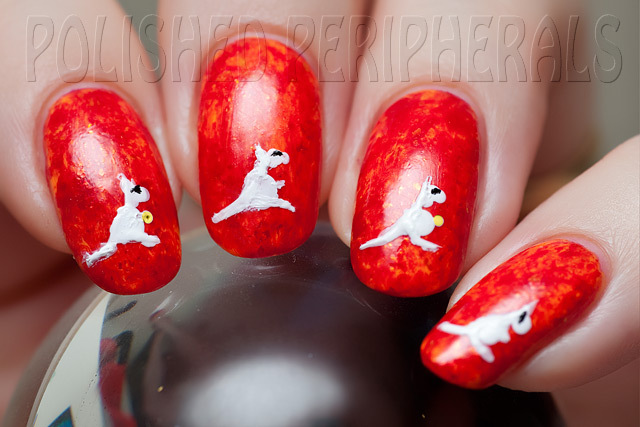 So I used my Glad Wrap manicure as the blazing sun background and attempted to paint some white kangaroos. I used Ulta3 Lily White for my boomers (and a dodgy brush with bristles in all directions). Yeh I know that's only 4 boomers but 2 of them are banging cymbals. It's a boom, crash, opera which makes 2 of them double boomers, so that makes 6 boomers right? No? Ok well it's all you're getting. I much preferred my nails before the boomers made a mess of them. BTW they're wearing sunglasses. Our first theme is RED. 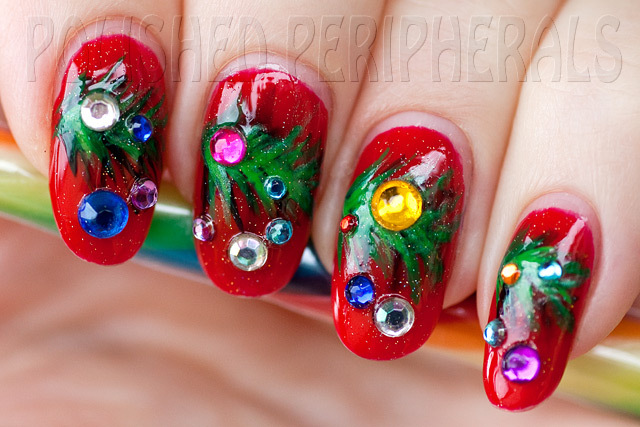 A pretty traditional Christmas colour and I have a heap of red polishes that would work. 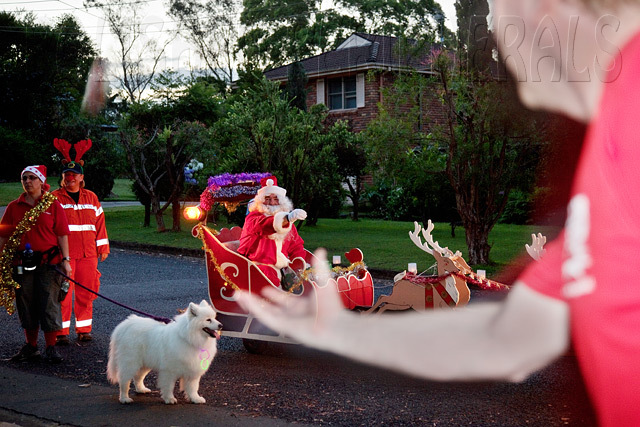 So what is red about an Aussie Christmas? Santa's suit, Rudolph's nose, sunburn, my face as I run around organising things (I'm hosting Christmas again this year), cherries and wine. Red, red wine :) Actually my choice of drink for Christmas day is champagne but there's usually some red wine floating around.... and here it is with cherries on top (under)! It looks pretty bad, I'd have probably been better off just drinking the wine and eating the cherries. Still it fits the challenge :) Oh and I added the writing in photoshop. There's no way I could paint that. 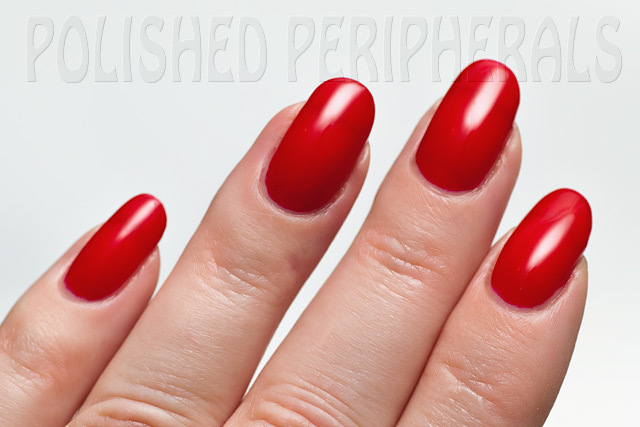 The red polish is actually an LED UV Gel hybrid polish. 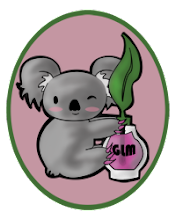 It's Hit the Gym from Gelicious (not Gelous). 3 coats of Hit the Gym with one coat of their Ultra Glaze Top Coat. Hit the Gym is a bit sheer, with most of the Gelicious colours I only need 2 coats. I've been wearing Gelicious a lot lately. It's quick and easy and last weeks. There's no need for any buffing, primer or base coat. Just 2 or 3 really thin coats of colour, 1 min each to cure, then 1 thin top coat with 2 mins to cure. Wipe it clean with an acetone polish remover and it's done. Set dry, solid and strong so my nails don't break. I can do it before bed with no risk of sheet nails and I've never had any chipping or lifting. I usually leave it on for at least 2 weeks. Mostly I use clear or a really sheer pink and it serves as my base coat for regular polish. I can paint over the Gelicious and as long as I use an acetone free remover I can keep changing my polish without effecting the gel. It stays shiny and smooth. If I use black Gelicious it's perfect as my base colour for swatching duochromes, over and over. It even survives the removal of glitter polishes. I've found my polish lasts longer over the gel too, it doesn't chip or crack and most of the time I don't need a top coat unless it's to smooth glitter. The Gelicious is quite thin, even with 3 or 4 coats, which means as it grows out I can keep painting over it without a noticeable step down where the growth line is. Yep I love it and now I've done red I'll be trying to make my challenge nails work with a red base colour for the next few weeks.